The event was put on by the JLG’s Done in a Day committee, as well as Greenwich High School students who volunteered and announced games, such as Bingo. 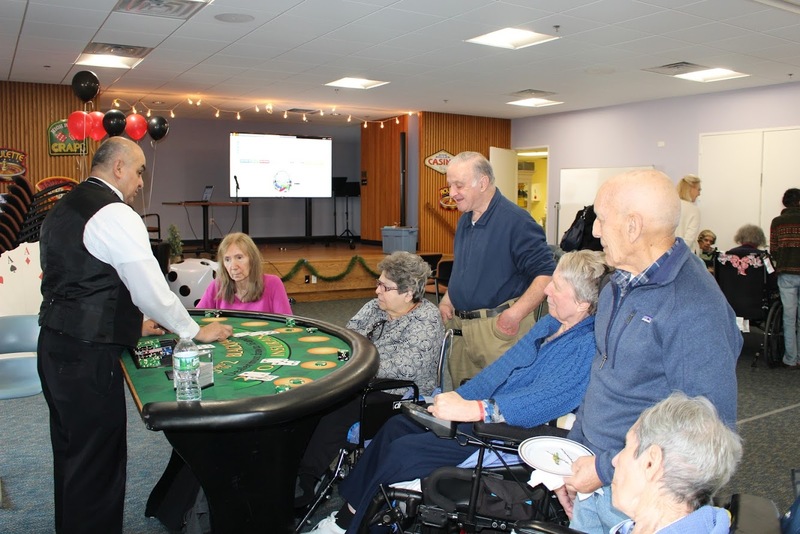 The room was decorated with a casino theme and the residents were able to enjoy food from Balducci’s, cake from Stop & Shop and other refreshments. The residents were also able to win cash prizes and gift certificates, including on-site spa services and other goodies. It was a fun-filled day for all and excitement filled the room! The Nathaniel Witherell is a short-term rehab and skilled nursing center located on 24 beautiful acres, just two miles from downtown Greenwich. The Witherell is committed to person-centered care provided by a compassionate, highly competent and experienced staff. They are a nonprofit that is owned and operated by the Town of Greenwich. The center has served the community since 1903.